Coming to train at Fairfax Jiu Jitsu is by far head and shoulders above any other establishment in the Northern Virginia area. First of all, every student (and I do mean every student) is given the opportunity to excel, advance and achieve. This is not a statement I could make lightly. Since I am slightly older than most of the students here, I really did not know where I would fit in but from my first introduction at Fairfax Jiu Jitsu, I knew that this would be the place where I could see and seek constant improvement. Coach Mark and Coach Sam put the safety and welfare of each student first and reinforce that code with constant vigilance. The striking program (Muay Thai) that I enrolled in is under the direction of Coach Bill and Coach Matt. Coach Bill and Coach Matt recognizes the different levels and abilities of each person and are dedicated to getting the best performance out of each student. Their approach to Muay Thai is not a cookie-cutter, one-size-fits-all program. Again, since I am an older student, I appreciate the fact that I can and do train with others that are better, more skilled and more knowledgeable than I. This is where real growth and improvement can and does takes place and Coach Bill and Coach Matt will make sure that constant improvement will always be your goal. As long as you, the student, have the drive, dedication, mind-set and an open attitude to be coached and directed, you will never plateau. The environment created by Fairfax Jiu Jitsu, the coaches and students is free of attitudes, egos and puffed-up personalities. The support among your peers is sincere and reinforcing — getting out of your ‘comfort zone’ is encouraged and recognized. For me, it is a pleasure to be in a group of hard working and hard charging individuals and the best part of my day is the time when I am training here at Fairfax Jiu Jitsu. I’ve been training BJJ, Muay Thai, and MMA at Fairfax for about a year and a half. The thing that I’ve noticed the most is that my skills have improved greatly ever since I started . I attribute this to the excellent instructors. Their curriculum and class structure is well thought out, and their approach is geared towards training smart in order to get the most out of every session. They also have a great facility and a wealth of solid training partners of all skill levels. 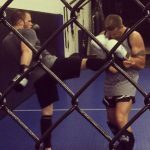 I recently had my first MMA fight and I was surprised at how prepared I felt, both physically and mentally. I would definitely recommend Fairfax Jiu Jitsu to anyone looking to start or continue their martial arts journey. Sam and Mark are two of the best jiu jitsu instructors I’ve had the pleasure of learning from. I’ve learned something from them every time I step on the mat with them, and I’ve laughed every class. Literally one of the best decisions I could have ever made. I was looking to learn bjj and I walked into FJJ as my first stop on academy hunting. I didn’t need to visit any other academies. The culture in what FJJ teaches is very team an individual oriented. Literally some of the best instructors you could ask for. Even if it’s a little out of your way, like it is for me, FJJ is so worth it. Honestly in the time I’ve been here this place has become a home for me, and I hope to learn from Sam and Mark for many years. They’ve helped me not just fall in love with bjj, but helped me become obsessed with it haha. I’ll put it this way, there are several Jiu Jitsu schools just minutes from where I live but instead joined FJJ, where I’ve been a member for almost a year now. Keep in mind FJJ is an hour away from where I live, but that just shows how highly I think of the school, it’s instructors, and fellow students.